Google has officially introduced the Nexus One smartphone made by HTC running brand new Android 2.1. This measures 119 (H) x 59.8 (W) x 11.5 (D) mm, weights 130 grams, and boasts a 1GHz Qualcomm Snapdragon processor QSD 8250, 512MB of flash memory and 512MB of RAM, a 3.7-inch (800×480) AMOLED screen, plus a 5 megapixel camera with autofocus and LED flash. Nexus One comes with 3.5mm headphone jack, and a multicolored LED under the trackball. There are also two mics, one on the bottom and one on the back, for the purpose of noise cancellation, and can be custom engraved with two lines of text at the time of order. The phone support features of HSDPA 7.2 Mbps, HSUPA 2 Mbps, 3G and GSM, EDGE, WiFi and Bluetooth 2.1, GPS, an accelerometer, light and proximity sensor and a digital compass. 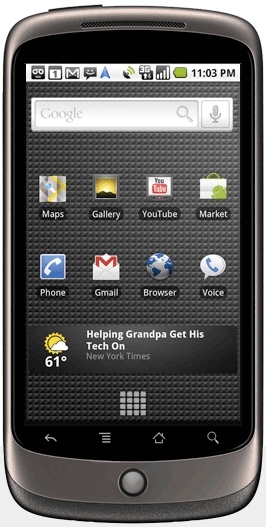 The Nexus One is currently available from Google at $529 unlocked or $179 with a two-year T-Mobile contract ($79.99 per month). The plan-free Nexus One can ship in the US, the UK, Hong Kong and Singapore, with a wider availability being scheduled for later within the year. This spring the phone will also be offered with contracts from Verizon and Vodafone.